I love little mysteries. 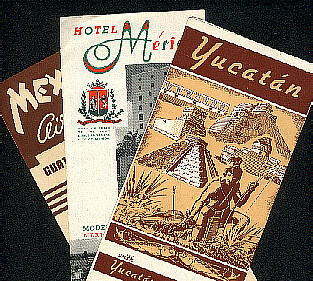 Some months ago, I purchased on eBay a group of travel brochures, receipts, photographs and other documents, all related to a couple and their visit to Yucatan in May of 1954. Recently I pulled them out and decided, for fun, to find out who they were. There was a name on one of the documents: Mr. and Mrs. Leonard Stegman, no address. Their name appeared on a receipt from the American Express travel agency of New Orleans. Among the documents there was a letter from, apparently, a friend or acquaintance, and signed only with a first name, "Giles." His letterhead was unusual, a row of Mayan glyphs stretching across the top. Underneath was an address in Pacific Palisades, California. The letter was full of advice of what to see when in Yucatan. The writer Giles clearly had spent some time there. I Googled "Leonard Stegman" and got back a bunch of results, nothing sticking out. I Googled "Giles" and Pacific Palisades and got lucky. Giles of the letter had to be Giles Healey, the man who discovered the murals at Bonampak in 1946. The Bonampak murals, from the late 8th century, cover the walls of three rooms. One article on the Web mentioned Healey had resided in Pacific Palisades. Giles dropped a few names of those engaged in Mayan archaeology of the period. I switched my search back to Leonard Stegman, this time, on a hunch, added "Pacific Palisades." I guessed Healey and the Stegmans might have been neighbors, and from there hit the jackpot again. The Orange County Register recently interviewed a Leonard Stegman who was married to best-selling novelist Maritta Wolff. She and Stegman married in 1947. By that time she had written a couple of best selling novels, the most famous being Whistle Stop. There is an almost heartbreaking story about her last novel, Sudden Rain. When she first submitted the book in the 1970s, the publisher rejected it. It was her first rejection in more than 30 years of publishing. Wolff gave up writing forever. After she died in 2002, her husband found the rejected manuscript in her refrigerator. The novel found a publisher, and was published in 2005. If the photographs are any evidence, the couple did make it to Yucatan. 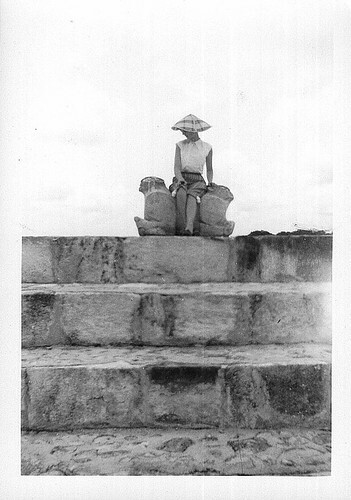 There are several pictures of Chichen and elsewhere in Yucatan, but only one with a non-native person. 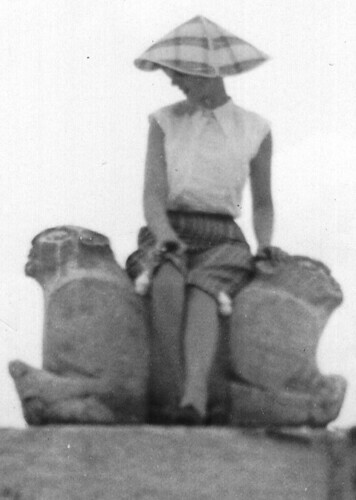 A woman sits on some Maya statue. Her face is obscured by a hat, and the photographer was too far away to get a sharp picture. Top Hotel in Merida Is the "Merida" (expensive). My favorite is the Casa Camara. This is an old mansion that has fair meals. Best bet is to take it with breakfast and eat out. Ruins : Go to Chichen Itza and stay at the Maya Inn (owned by Barbachano of the Merida). Do make arrangements beforehand at the Merida as this Chichen Inn Is small. If you can sleep in a hammock then stay at Chichen at Dona Victorias. Go to Uxmal and from there go on to Santa Ellena. This again is a hammock town. From Santa Ellena be sure to take the auto road to the Ruin of Kabah. that you are a friend of mine. At Campeche Museum see Dr Raul Pavon Abreu and ask him if he Is going to the ruin of Etzna. Hammocks :	Buy them near the arcade of the big market. See them all and price them. The big long ones are the most comfortable. Sleep diagonally in them. Panama Hats are made near Campeche by women who weave them in caves . Bring me back a couple of bottles of Xtabentun. This is a meade of fermented honey. Swimming. It you want to swim in the hot sea go the Progresso. Brush teeth with bottled mineral water. Coffee is safe as water is boiled. Best beer "Carta Blanca." Too much beer will give the pip in the tropics. To avoid ticks: Lather your body daily with mercury chloride soap and let lather dry on before you dress. If you take color film, underexpose by one-half stop. He also asks at the bottom of the letter, "Please mail back the Maya book." In another hand, someone circled "Campeche" and wrote a note, "Good crabs." This article originally appeared on Merida Insider, a Web community for residents and visitors of Merida and Yucatan.